Whales everywhere! 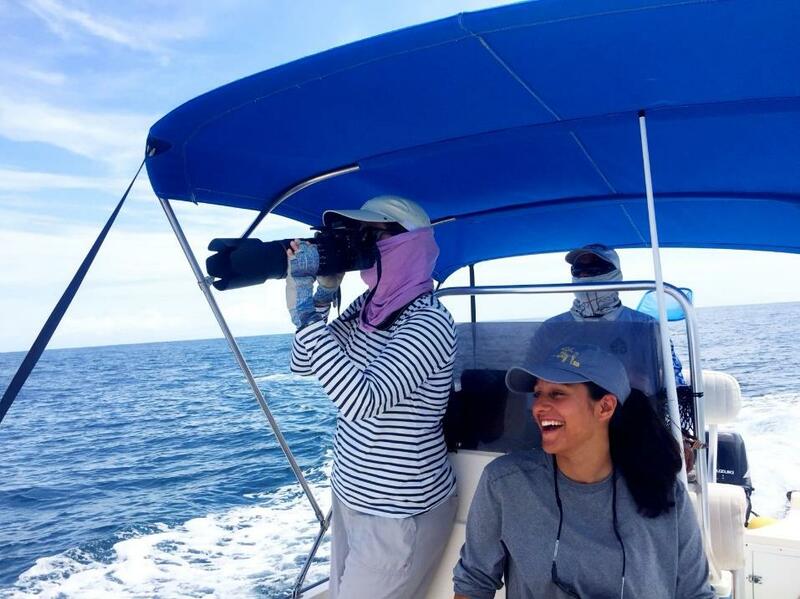 That captures my experience participating in a research project on the Southern Hemisphere humpback whales that my colleague Kristin Rasmussen from Panacetacea conducts in the Gulf of Chiriqui, Panama. I was in Panama last month for a period of 10 days. Humpback whales come from both the Southern Hemisphere (July to October with over 2,000 whales) and the Northern Hemisphere (December to March about 450 whales along Central America) to Panama (and Costa Rica). They undertake annual migrations from polar summer feeding grounds to winter calving and nursery grounds in subtropical and tropical coastal waters. This field season includes the ongoing photographic identification of humpback whales that examines their movements from and to Antarctica. Approximately 668 individual whales have been identified since the project started in 2006, and some whales have been sighted for multiple years. Tissue biopsy samples are also collected to examine the composition of the groups and the genetic makeup of this particular population segment. 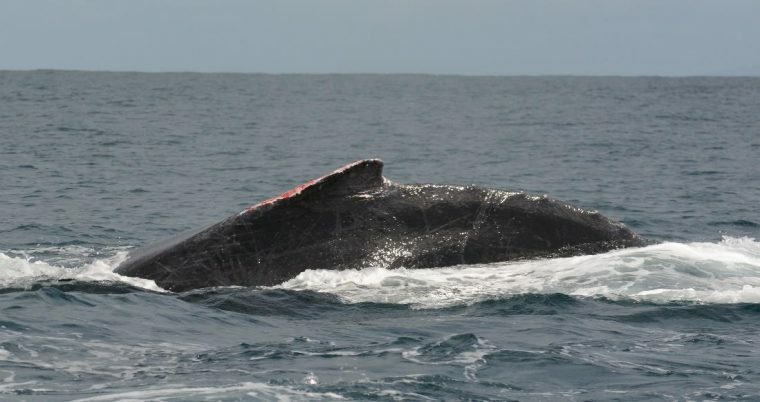 This included a collaboration with Dr. Ursula Gonzalez Peral, a Mexican genetic conservationist with extensive experience in the collection of biopsy samples of humpback whales. Kristin Rasmussen photographing humpback whales. Scientific Permit No. SE/A-70-18 Ministerio de Ambiente, Republica de Panama. We encountered about 15 to 28 humpback whales every day, including mothers with young calves (only a couple of weeks old), mothers with calves and escorts, a rare nursery group, singers, pairs, and active competitive groups. The latter represents intrasexual competition among males for sexual access to a female ready for reproduction. 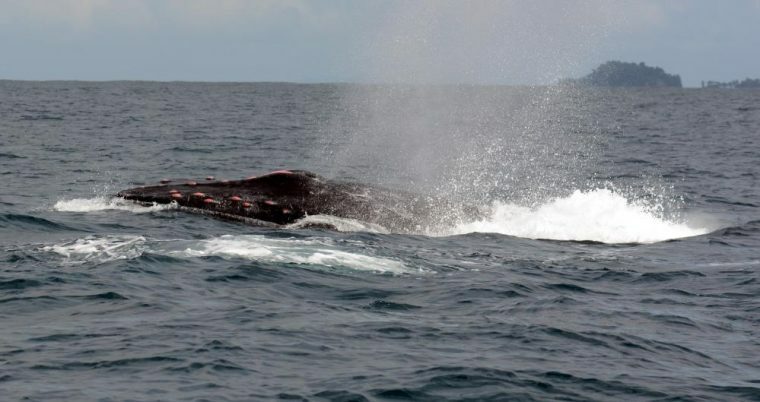 The high number and diversity of groups are not a common sight at all Central American breeding grounds, where observers might only encounter one to four humpback whales on any given day. 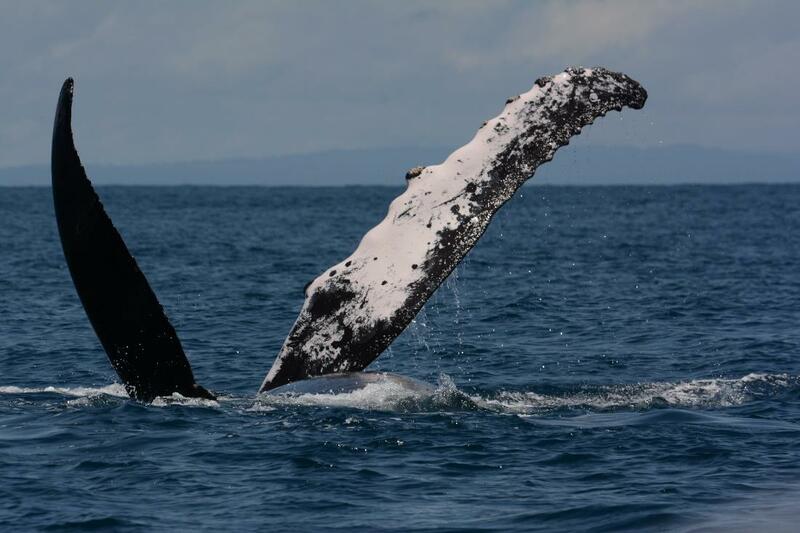 In the Gulf of Chiriqui, however, humpback whales are abundant and engage in all kinds of activities. Three humpback whales. Photograph taken by Kristin Rasmussen. Scientific Permit No. SE/A-70-18 Ministerio de Ambiente, Republica de Panama. I was particularly intrigued by the competitive groups because males engage in aggressive and acrobatic behaviors that can escalate to severe body strikes resulting in bloody fins or rostral tubercles. Humpback whales are one of the largest animals in the planet, and males have an average body length of 12 to 14 meters (40 to 45 feet). Thus, seeing them engage in competitive behaviors for primary position to mate with a female was fascinating. Bloody male humpback. Photograph taken by Kristin Rasmussen. Scientific Permit No. SE/A-70-18 Ministerio de Ambiente, Republica de Panama. We came across several competitive groups and were able to biopsy many of the group members. This will provide information on their relationships. 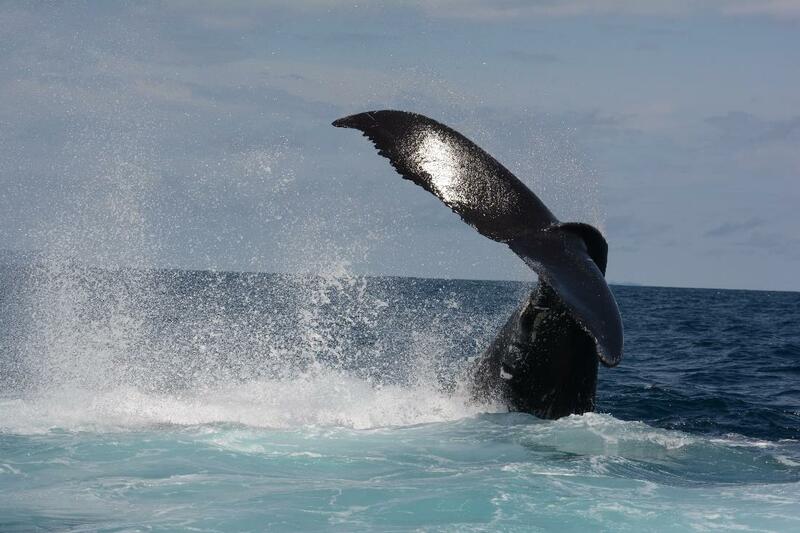 It is also the first genetic study of the Southern Hemisphere humpback whales sighted in Panama. Photograph taken by Kristin Rasmussen. Scientific Permit No. SE/A-70-18 Ministerio de Ambiente, Republica de Panama. 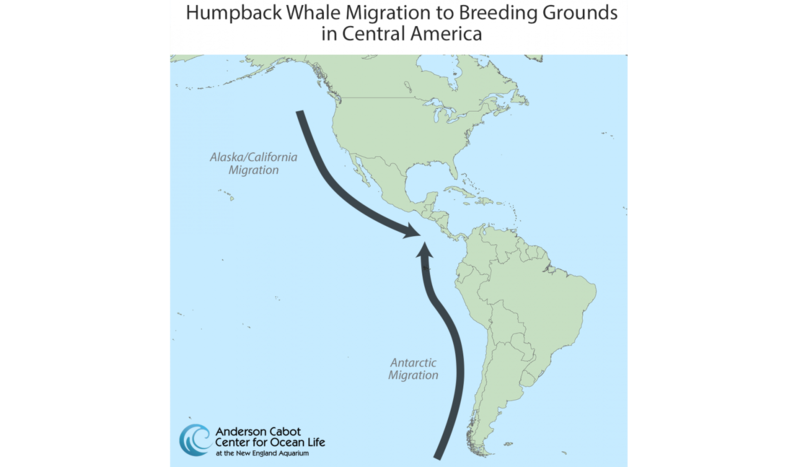 Although this describes some of the work conducted on the Southern Hemisphere humpback whales, the plan is to collaborate with Panacetacea and compare the movement patterns of the Northern Hemisphere humpback whales between Panama and other breeding grounds in Central America that are farther north. We are particularly interested in comparing them with data from Guatemala, where I have been studying humpback whales since 2008. Preliminary analyses suggest that a portion of the humpback whales has been resighted in these two breeding grounds. 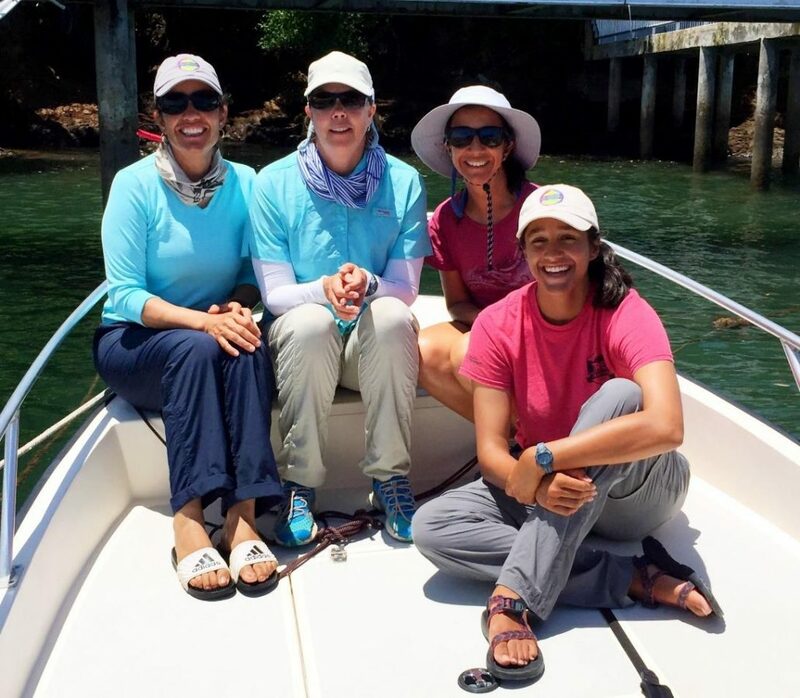 From left to right: Ester Quintana (Anderson Cabot Center for Ocean Life), Kristin Rasmussen (Panacetacea), Ursula Gonzalez Peral (Mexico), and Amara Chittenden (University of Vermont). In Panama, we stayed at Isla Cavada, a small private resort owned by a conservation philanthropist who has been supporting the research conducted by Panacetacea. Isla Cavada is part of a group of 14 islands called Islas Secas in the Gulf of Chiriqui. The beauty of the islands is breathtaking. They are lush with vegetation and are home to more than 128 species of plants and 750 species of fish. A short boat ride away is Coiba National Marine Park, a UNESCO-designated protected marine area known for an extraordinary biodiversity of its marine ecosystems. Scientific and Industry Collaborators: Kristin Rasmussen, M.S. (Panacetacea), Dr. Ursula Gonzalez Peral (Mexico).